This is a wonderful book on the one of the topic which is directly related to the health of the people. The topic of the book is self explanatory “Adulteration Analysis of Some Foods and Drugs”. The information related to adulteration analysis is now become one of the fundamental right of the people. This is well known fact that adulteration of foods and drugs is common mishaps in the part of world which is either not developed or facing the challenges to be count in the developed countries. The adulteration of colorants, aphrodisiacs, herbal supplements and dairy products are not rare. The concept of the book is straight and the technical depth is kept balanced to be understood by the young scientific community as well as researchers of this field. Major food adulteration and contamination events seem to occur with some regularity, such as the widely publicised adulteration of milk products with melamine and the recent microbial contamination of vegetables across Europe for example. With globalization and rapid distribution systems, these can have international impacts with far-reaching and sometimes lethal consequences . There are number of rules and regulations related to mixing anything which should be not present in any food or drugs. The intention of such mixing is very clear; to increase the profit. Adulteration is thus one of the serious crimes for the mankind. Adulteration is a major concern for both the food industry and consumers for many reasons. Thus the compendia containing analytical methodologies for the determination of adulterants is one of the needs in the current scenario. The technical depth and knowledge covered by the book delighted me and I could not simply stop myself to attend to it. I think the authors will found it one of the interesting guide of this field and in all I think you will find this book engaging in every chapter. I feel this will be a tonic stimulant for the flow of knowledge in its field. The adulteration of food and drug is one of the emerging problem especially in developing and underdeveloped countries. Medicinal products are highly regulated to ensure high quality and safety. Of particular importance is the identification and quantification of pharmaceutical impurities in medicinal products, active ingredients and pharmaceutical excipients, as they may influence the efficacy and safety of pharmaceutical products even in small amounts [1,2]. The adulteration of food products is of primary concern for consumers, food processors, regulatory agencies, and industries . The adulteration and Substitution of the herbal drugs is the burning problem in herbal industry and it has caused a major advancement in the research on commercial natural products. The deforestation and extinction of many species and incorrect identification of many plants has resulted in adulteration and substitution of raw drugs . No doubt, substitution is helpful in places where unavailability of particular crude drug and or unwanted adverse effects of desired crude drug are there and have a choice of other drug with similar pharmacological effect and less unwanted after effects. But in most cases, it is unacceptable because the conversion of authentic drug into substandard drug may cause variety of adverse effects from mild and moderate to severe life threatening reactions . Herbal adulteration is one of the common malpractices in herbal raw material trade . The adulteration of dietary supplements has been reported fairly frequently, yet most consumers and health care professionals are unfamiliar with the problem . Thus there if the food or drug is found to be adulterated the analysis of adulterants is important. This forms the basis for which this project is conceived and compiled in to the form of book. The first chapter of the book (Authors: Shrivastava A & Kumar R) is an introductory portion. The following chapter deals with some basics related to the topic of book like definitions and explanations like food, food fraud history of food adulteration and ends up with some brief description of Codex Alimentarius. The second chapter (Authors: Agrimonti C & Marmiroli N) reviews the application of genomics against adulteration in dairy food chain, in particular application to identify milk and cheese animal origin. Amplification of single traits of animal DNA, residual in milk and cheese, through end point or real time PCR, allowed the identification, and in some cases the quantitation, of animal contribute to dairy products. The third chapter (Authors: Fang M, Chia-Fen T, & Hwei-Fang C) is about inspection of colorant adulteration by modern LC mass spectrometry. This chapter introduces modern mass spectrometry for the detection of dyes in foods. This chapter also includes the application of DIA (data-independent acquisition) for simultaneously screening and confirmation of dyes in various foods. The fourth chapter (Author: Shrivastava A) is about analysis of adulteration in Honey. This chapter describes briefly nutritious benefits and composition of honey. The analysis of adulteration of honey is described in different sections; Liquid Chromatography (LC), Nuclear Magnetic Resonance (NMR), Near Infrared Spectroscopy (NIS), Rheology and Sensors. The fifth chapter (Author: Shrivastava A) is about adulteration analysis of drugs by UV spectrophotometry. UV Vis spectrophotometry is one of the basic analytical technique in the analysis of many inorganic and organic molecules. It is also used for the determination of complex mixtures to some extent. UV Vis spectrophotometry is used for both industrial and academic research. This chapter includes determination of adulteration of some drugs by using this versatile technique. The sixth chapter (Authors: Özge T & Taner B) described the adulteration analysis of Pomegranate Juice. An adulterated pomegranate juice can be identified if its chemical composition differs from the range of a pure juice. The most frequently methods used to detect adulteration of pomegranate juice are based on the profiling and quantification of a number of compounds such as carbohydrates, phenolic compounds, amino acids, anthocyanins and pigments, and organic acids. Traditional chemical analysis techniques such as high performance liquid chromatography (HPLC), gas chromatography (GC), and attenuated total reflection (ATR)-Fourier transform infrared (FTIR) spectroscopy have also been successfully used to determine the authenticity of pomegranate juices. The seventh chapter (Authors: Schramek N & Wollein U) is about adulterations in Dietary Supplements. This chapter highlights the most common synthetic substances found as adulterants in dietary supplements, and describes the analysis and the difficulties with the scientific assessment, using sexual enhancement products as an example. 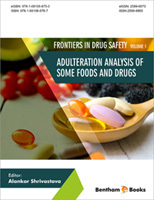 The chapter eight (Authors: Demirezer LO & Ucakturk E) is about adulterations of food supplements and analytical methodologies for their quality control. The adulteration or substitution of the herbal products especially food supplements are the major problem in herbal industry and it has caused a major treat in the research on commercial natural products. Thin-layer chromatography, liquid chromatography, gas chromatography and capillary electrophoresis, chromatographic fingerprinting analysis are employed for the identification and quantification of bioactive compounds, impurities, contaminants, and also other compounds present in the food supplements. The chapter nine (Authors: Sherazi STH, Mahesar SA, Kandhro AA, & Sirajuddin) is about trans fat analysis in some foods. trans fat is supposed to be unwanted fat and in the diet it should be as minimum as possible. Therefore, labeling of trans fat is mandatory in all foods in which fats and oils are involved. For the labeling of trans fat on food products adequate analytical methods are required. Therefore, the present review will cover brief outline of analytical techniques used for the analysis of trans fat. The last and tenth chapter (Author: Sharma B) is about analysis of adulterants in Saffron. Saffron is of commercial importance for manufacturers because of its flavoring properties in food industry and medicinal properties in pharmaceutical industry. The biological source is the dried stigma of the flower Crocus sativus L. In the present chapter, adulteration of saffron and various physical, chemical and analytical techniques like TLC and spectroscopy etc. for the rapid detection and identification of pure and fake saffron are described. I hope this book will extend learning beyond the limitations of some websites and articles published in the segment of adulteration analysis in some foods, dietary supplements and drugs. I welcome the authors to send their suggestions via email. Roy J. Pharmaceutical impurities–a mini-review. AAPS PharmSciTech 2002; 3: 1-8. Prakash O. Jyoti, Kumar A, Kumar P. Niranjan Kumar MannaAdulteration and Substitution in Indian Medicinal Plants: An overview. Journal of Medicinal Plants Studies 2013; 1(4): 127-32. Ahmed S, Hasan MM. Crude Drug Adulteration: A Concise Review. World J Pharm Pharm Sci 4(10): 274-83. Sagar PK. Adulteration and substitution in endangered ASU medicinal plants of India: A Review. Int J Med Arom Plants 2014; 4(1): 56-73.